Hyacinth is a rather unusual flower, and in Greek it means "rain flower". Indeed, in Asia Minor (the motherland of hyacinths), this flower blossoms in the spring with the first warm rains. Hyacinth was always appreciated for its splendor, unusual shape and bright shades of flowers. In addition, this flower has a very pleasant, delicate and truly persistent aroma. Therefore, gardeners are very fond of decorating their landscape with these flowers, planting them in surprisingly beautiful compositions. Hyacinth is a perennial bulbous plant, numbering about 30 wild species. Different types of hyacinths are widespread in the Middle and Near Asia, in the Mediterranean basin. As noted earlier, hyacinth - it's still a garden plant. Therefore, in order to grow hyacinth at home, you need to create appropriate conditions for it. Unfortunately, hyacinth is not a plant that can please you for years. Bulbs are used at home only for distillation. In turn, forcing is the creation of an enabling environment for accelerating plant growth. After distilling, the bulb of the hyacinth must be planted in the open soil for restoration. The fact is that by itself, forcing, too depletes the plant and for repeated flowering, it just simply does not have enough strength. Therefore, after leaving at home, hyacinth should be transplanted into the garden. 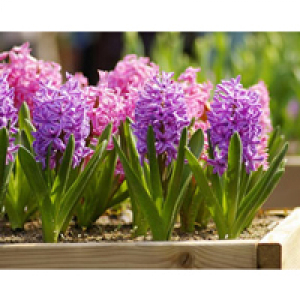 Most often, blossoming hyacinth is purchased in the store, followed by care of it at home. When it fades - it's time to transplant it into conditions that are more suitable for this flower! In the pot you can plant as one, and three bulbs. The size of the pot should be selected according to the size and number of bulbs. Make sure that they are not crowded there. Also, it is important to remember that the distance between the bulbs should be about 2-2.5 centimeters. At the bottom of the pot must put a layer of drainage (you can also use a layer of sand, about 2-3 centimeters). Peat with sand can be used for the substrate itself. 1/3 part of the bulb (in other words, the tip of the bulb) must necessarily be above the ground. Above, the substrate can be sprinkled with sand. The sand layer should vary from 0.5 to 1 centimeter. The presence of a thin layer of sand on the surface of the substrate will prevent rotting of the bulbs. After planting for irrigation, you can use a 0.2% solution of calcium nitrate. After planting pots with bulbs must be placed in a dark, cool place for a period of 6 to 10 weeks. The air temperature in such a place should be approximately from +5 to +9 degrees. To close the bulb from the light, you can use the black package. Thus, you will create the conditions that are necessary for the growth of the bulb in the autumn garden. How correctly to water hyacinth? Hyacinth loves the abundance of water, but it should not form stagnation. Because of this, the bulb can begin to rot. To prevent stagnation of the liquid, it is necessary that the pot had a drainage layer. Also, "excess" water after watering, you need to drain. When watering hyacinth, it is important that water does not get on the bud, the bulb itself, the leaves. An excellent option for the correct watering of the hyacinth is to pour water into the pot tray. A hyacinth can have a flower stem very short, flowers can begin to blossom, being in the rosette of leaves. 1. Insufficient watering. Do not allow the substrate to dry out in which the hyacinth is located. 2. High temperature or bright light after a long cooling period. Adaptation of the hyacinth after the "autumn" conditions should occur gradually. In the first days after the cooling period, it is necessary to maintain the temperature in the room, where the hyacinth is at about +12 degrees, and keep it in a place that is not too bright.